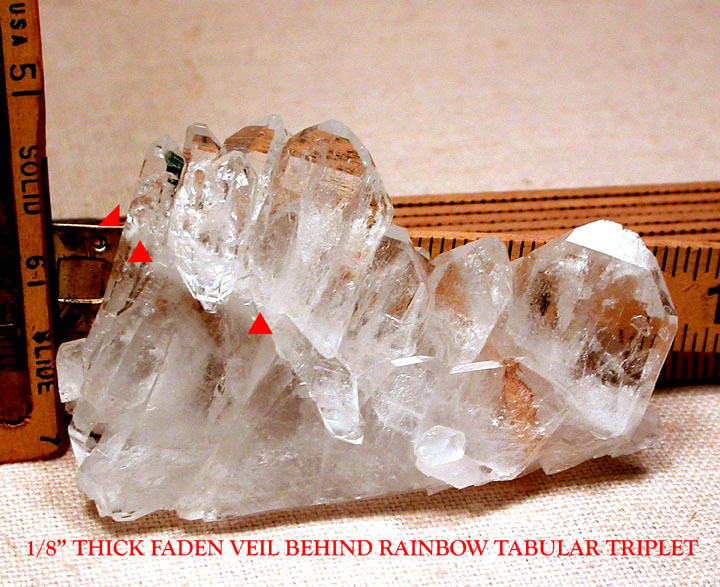 A Tabular Cathedral Crystal Cluster, Faden Veils - extremely rare - Arkansas. Home > Spoken For - The Archives Of SOLD Crystals, Clusters, Rough.... > SOLD: A Tabular Cathedral Crystal Cluster, Faden Veils - extremely rare - Arkansas. 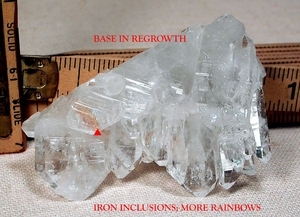 Formidable slightly curved row of Arkansas tabular crystals has nearly completely regrown [Hera] crystals across its' base. Self-displaying at 1x 2 x 3 1/4" wide, there's a rare, also slightly curved faden veil we hope you can see in the photos. Plenty of rainbows, penetrator crystals, and a few pale iron inclusions highlight the cathedral of several layers. A tabular cathedral - extremely rare. Great for your collection and communication, negotiations.